10181 Eiffel Tower ($199.99 MSRP) is available at Amazon for $162.87 + free shipping. This one isn't LEGO, but I thought maybe Don could benefit from it. Pretty safe bet that Don has that already! I'll sell an Eiffel Tower set never built but no box for $150 plus $10 shipping. Whether it be Amazon, Wally World, TRU, or Target, the sales have been great this year. Too bad wallet is skinnier too, or else I'd be stocking up. Must have missed the train on this one...would've been worth it, but it appears to be back up to MSRP. 7675 AT-TE Walker 62.99 (save 27.00 30%), my wife noticed this on sale this morn and this is at the top of my son's wishlist. Eiffel Tower now down to $123.99 with free shipping. I snagged an Eiffel Tower for my brother for Christmas at $123.99, and this morning it's back up to $159.99. I think either Amazon has a supremely sophisticated algorithm for maximizing profit by manipulating price points, or they have absolutely no rhyme or reason to their madness. Not sure which I believe more at this point. Green Grocer now $92.99 with free shipping. Well if retailers report poor sales this holiday season, it won't be because of me. Not sure what I'm going to do with a second Green Grocer, but that price is awesome. I never thought I'd get it on sale. If you check out today's Gold Box there are two lightning deals that might be of interest. They will each only be an hour long. At 11pm the hint is "You can have your own personal robot at a price that is out of this world and from a galaxy far, far away! 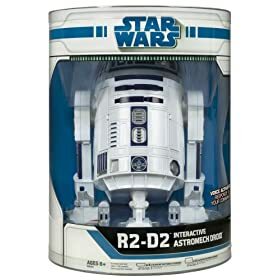 If you ask this toy if he remembers his famous friends, like Luke Skywalker, C-3PO or Jabba the Hutt, each name will stir up a different..." and the robotic R2D2 is already marked down 47% and already came up once in this thread. At 1pm the hint is: "This is a deal you just can't "LEGO". Swing on in like Indy and "cut" down this great deal!" I am guessing the Jungle cutter (7626), already marked down 30%. I see that the jungle cutter has made its way to the #1 top selling LEGO item. Does anyone know its sale price during the brief deal? It was $19.99 (50%off). Unfortunately, I was unable to be at my computer and missed it! It was $19.99 for an hour at 4PM EST. I thought it was worth picking up another one at this price. A limit of one per customer(not per transaction, like Amazon frequently does), but the price has been $27.99 for a while. I'm not sure how many people get around the 1 per customer limit, but only 78% of those available were claimed - a lot of the lightning deals sell out. On the deals page, http://www.amazon.com/gp/goldbox/ref=cs_top_nav_gb27 you can check previous deals for the day. I saw a post over at fatwallet talking about the 44.99 price, what a bizarre time for a lightning deal. I was even up at 5am, but I think it was gone by then. Oh well. At the amount of deals Amazon is dishing out this month, I probably shouldn't even sleep. Do you know a Star Wars fan? Well here's a deal you won't want to "LEGO"! Fire up your starfighter and jump on this hot deal while it lasts! I guessing that it will be the MagnaGuard Starfighter, probably at $24.99. Not sure if I will pull the trigger on that one or not - who am I kidding, of course I will. If it is the V-19, I think it will be $29.99 - not quite 50% off. Hopefully I will be around the internet at that time. at te is now at $69.99, gonna wait to see if it goes back to 49.99. As another member has alluded, cannot go to sleep if you want those ridiculous amazon deals or be buying lego at your workplace! Thanks for the catch. Somehow my mind melded the two sets together... hey it's early! ...and the deal is for the Magna Droid Starfighter, for $22.99US. That's 48% off. I find it interesting that with this and the Jungle Cutter that you are $2 short of free shipping. Anyone one else feel the need to buy up? The Exo-Force Shadow Crawler can be had for $8 and some change. Got it with free shipping due to the way the cart discounts calculate. $22.99, no tax, no shipping. Couldn't pass it up! And it's going fast too. I'm happy to not be in an exam right now. Only wish I could get more than one. 56% as of 11:22 a.m. PST. Grr. I added it to my cart, and then deleted it before I found out it still qualified for free shipping. Now, Amazon things I've claimed the offer, and I can't add it again.